Announcing the 14(and ½)th Right Place Photo Caption Contest of Season two! I would like to send out my thanks to all of the contestants, who made this one of the best contests I’ve created. And now here are the Top 15 entries, as I saw fit to judge. 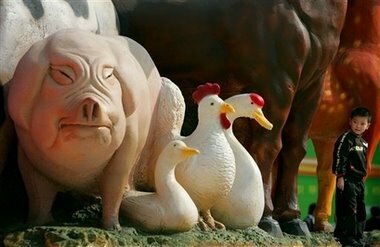 -- Is it racist for the Chinese to make a pig look Chinese? -- Civil Rights groups protested the segregation of the white meats from the others, but nobody cared. --Oh, great another picture of Helen Thom... oh, it's a pig. Never mind. -- Bill Clinton, pictured with Chelsea, Hillary, and Monica. -- Little Boy: "So maybe Nucrear testing wasn't such a good idea Kim." #9: Riots follow in Denmark as Muhammed is shown having Asian features. #8: Little Tae Kwan Park was disappointed to learn that you had to be at least as tall as a pig's weenie to go on the new Space Mountain ride at Disney North Korea. #7: In the remake of Animal Farm, Bill Clinton is the voice of Napoleon. "All sexual indiscretions are equal, but some are more equal than others." #6: Hey did someone finally get the focus right on that Hillary Clinton picture from the previous photo caption contest? #5: This is how the Main Stream Media see the world: the Republicans are the horses, but are not covered. The Democrats are truly the chickens, ducks, foul, and swine, but are portrayed in the media as the stars. #4: Although panned by many critics as "sick and f***ing creepy", Neverland Ranch's "Wax Petting Zoo & Boy Bait Extravaganza" annually ranks among the park's most popular exhibits for the 35-75 year-old, trench coat sporting, candy-wielding demographic. #3: As North Korea developed nukes, China worked on the developing the world's largest breakfast buffet. #2: Hey didn't that pig drive a car off a bridge once? #1: It's just like Congress! Whatever isn't pork is just plain fowl. Who's This Whiny Little Brat? I'm with John Kerry! Screw the troops! It's 9:45, do you know where your children are? John Kerry Is Right. You Are All Stupid! Jim Webb Can Put His Uglies in My Mouth Anytime! The Right Wording is Everything, Mr. Kerry! Why I Matter, or, All About Me! Yo, Blogsnot, What Up With My Spacing, Dawg? Hey Rush You Missed One! Where's Global Warming When You Need It?